When I listed “mandatory flu shots” on my recitation of all the woes I feared lay before us on account of the election of Barack Obama to his second term in office, that was more of a joke than not. A more “light-hearted” potential result of the mounting socialist state we face, than the other things I cited. I figured it would probably happen down the road some day, because that’s what socialist states do. When they come upon something they think is good for people, they then insist that everyone must do it or have it — or else. And when it can also be bent around to being for the public good, why — then it’s sure to be mandatory. But still, I didn’t expect it to happen so soon. Perhaps you’ve heard of the company in Cincinnati called TriHealth. It’s one of the city’s largest employers and this year it offered the flu vaccine for free to its 10,000+ employees. The latter had until Nov 16 to get the shot. Most took advantage of the offer, but the 150 who didn’t were fired last Wednesday for abstaining. They would be allowed to negotiate for rehiring, but only if they agreed to be vaccinated. I have to wonder why. 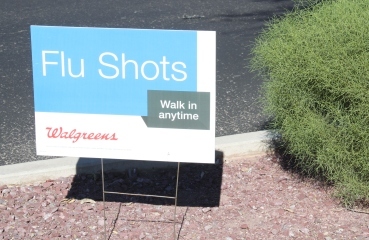 If the 10,650 other employees were vaccinated, what threat are the holdouts to them? The 150 may get the flu, but even if they do, the others, who were vaccinated, won’t, right? Wouldn’t that be “punishment” enough for their “foolish” decision? Or… maybe the higher-ups fear another kind of communicable disease… the one called freedom. If they let the 150 refrain, how many more will want to refrain next year? And the year after that? This entry was posted in Uncategorized on November 26, 2012 by Karen Hancock. Wow. I am reading Glenn Beck’s new book, “Agenda 12”, and there is so much in there that is hitting a little too close to home, especially when I read your post. End times, for sure. Actually, last summer, a sudden wind picked up one of those things and sent it over the fence and across the street into a neighbor’s yard. Kids were injured. One of them might have been killed. I can’t recall. But I’m not sure what a “trained operator” could have done except maybe tie the thing down properly. And I don’t even know that it wasn’t,/i> tied down properly. We get some pretty heavy duty winds around here at times. But if it were up to me, which thank goodness it’s not, I’d probably outlaw them altogether because I think they’re creepy, ugly, and certainly dirty and what’s wrong with the old party games we used to have a birthday parties? Jumping castles are just a convenient way for parents to get the kids occupied and out of their hair during a “party”. Kind of a giant, communal version of a video game. Here kids, go jump in that for a bit while we visit. Scowl. Grumble…I think I’m turning into a curmudgeon. None of that to say, you’re not correct all this stuff turning us into a nation of wusses. Or maybe we’re just trying hard to make heaven on earth, where no one will ever be harmed, get sick, die, etc. Hmm. Now I think of it, that pretty much IS what we’re trying to do — as a society anyway.